شاهزاده هم درست عین ما بود. پسری جوان و نا آگاه از بازی این سیاست مداران دنیا! چرا والا حضرت علیرضا در صحنه نیستند؟ ایشان هم از نظر درک و هوش و مدارک بالای تحصیلی میتوانند یک کمک موثر به شاهزاده و هدف باشند! در درجه اول قدرت یک شخص از فامیل میاید و بعد از دیگران. به این دجال احمدی نژاد نگاه کنید! اگر مادر بزرگش زنده بود او را اولین وزیر زن میکرد! از برادرش، تا زنش، تا داماداش همه و همه در بخش دولتی قلاب انداخته و حقوق بگیر دولت هستند. به برادران هاشمی‌ و فرزندان آنها نگاه کنید. به خامنه‌ای، آقا مجتبی‌، میثم. نمی‌ گوئیم آنها کار درستی‌ میکنند. همه‌شان مشغول چپاول ایران هستند. ولی‌ قدرت در حکومت را از كمك وياري همدیگر میگیرند. خاندان پهلوی میبایست مهره پشت کمک به شاهزاده بوده از نظر کمک فکری، مالی‌ و معنوی تا ایشان احتیاجی کمتر به مشاوران نه چندان با خلوص ‌نيتی داشته باشند. این چرا‌ها فقط چرا‌های گروه کوچک ما نیست. این چرا‌های تمام گروه هواداران شاهزاده است! فقط چون ما مدتی‌ است که تعارف را با همه کنار گذاشتیم با کمال عرض ادب درخواست جواب این چرا‌ها را داریم. شاید با جواب این چرا‌ها بتوانیم به هم نزدیک تر شده، بتوانیم همگی برنامه ریزی مدیریت و اداره گروه هواداران شاهزاده را درست کرده تا به هدف برسیم. With deepest condolences to the Royal Pahlavi family of Iran and Free Iran community for the sudden passing of Prince Alireza Pahlavi. از پخش این خبر غمبار بینهایت متاثر و متاسفم. شادروان شاهپور علیرضا پهلوی ، همچون میلیون‌ها جوان ایرانی، از آنچه که به ناروا بر میهن عزیزش می گذشت سخت آزرده و غمگین بود، و نیز هیچگاه خاطرۀ دردناک مرگ پدر و خواهر عزیزش او را رها نکرد. بسیار کوشید که به گونه‌ای بر این بحران درونی فائق آید، دریغا که موفق نشد، تا اینکه سرانجام در صبحگاه چهاردهم دی ماه ۱۳۸۹ (چهارم ژانویه ۲۰۱۱) در منزل مسکونی خود در شهر بوستون آمریکا به زندگی خود خاتمه داد و همۀ خانواده و دوستدارانش را در غمی عمیق فرو برد. مدیریت و همکاران تلویزیون پارس ، مراتب تاثر و همدردی خود را به خانواده پهلوی ابراز میدارند . It is a sad day for all Iranians, my heart aches for her Majesty Shahbanou and Prince Cyrus Reza Pahlavi. Condolences to the Royal Family. It is with great sadness to hear of the loss of your beloved son. I can only offer my deepest condolences to you and the entire Pahlavi family for the sudden passing of Prince Alireza Pahlavi. His loss is beyond understanding and my heart is filled with sympathy for your unimaginable loss. I loved and respected him. Even though this is the final journey that all of us will take, it is hard for those who are left behind. I know that he lives on through all of you, your memories of him and through all those people whose lives he has touched, both directly and indirectly. As we honor the memory of Prince Alireza Pahlavi, let me wish you peace and strength and God�s blessings. Despite the fact that the Iranian people have lost a great patriot in very difficult era, His Royal Highness Prince Ali Reza Pahlavi of Iran decision to be cremated and his remains released into the Caspian Sea has a great message to be admired and shared by many Iranians as a clear statement and complete rejection of any form of Islamic establishment in our motherland Iran �. Please join FREE Iran Community for a special candle light vigil in remembrance of H.I.H Prince Ali Reza Pahlavi of Iran. 5:00 pm on Sunday Jan 9, 2011 at Federal Bldg Los Angeles, CA. Ali Reza Pahlavi, the second son and third child of the late Shah Mohammad Reza Pahlavi and Shahbanu Farah (Diba) Pahlavi, committed suicide early Tuesday morning. Pahlavi, age 44, was a resident of Boston's South End neighborhood. According to a Boston Police Department spokeswoman, police officers responded to a call at 2:11 a.m. in the 100 block of West Newton Street, where his three-level row house is located. Pahlavi was found dead of an apparent "self-inflicted gunshot wound." Pahlavi, born in Tehran, left Iran with his family in 1979 when the Shah was deposed. They were residing in Cairo when his father died in July 1980. In 1982, the 16-year-old Pahlavi moved with his mother and two sisters from Egypt to the United States. He received a B.A. from Princeton University and, in 1992, an M.A. in Middle Eastern languages and cultures from the Columbia University Graduate School of Arts and Sciences. According to an online registry of Harvard University alumni, he received a Ph.D. in 2008 from Harvard's Graduate School of Arts and Sciences, where he studied at the Department of Near Eastern Language and Civilizations. Pahlavi was never married. He is survived by his mother; his brother, Reza; his sister, Farahnaz; and his half-sister, Shahnaz, from his father's first marriage. His younger sister, Leila, died of an apparently self-induced barbiturate overdose in 2001. -- Eds. A Ph.D. from Harvard; how exremely sad, such an intelligent, wonderful person to leave us. I do not know how to express my sorrow and condolences to you for passing of prince Alireza. True patriotic Iranians, my family and myself are grieving with you on such loss. Please remember however that you have tens of millions of sons, daughters, brothers and sisters who love you and stand behind you. Directions: From Indian School Rd., go south on 75th St., pass Main Street, and park on the right side of the street. If you have any problems, please call (480)206-6688. 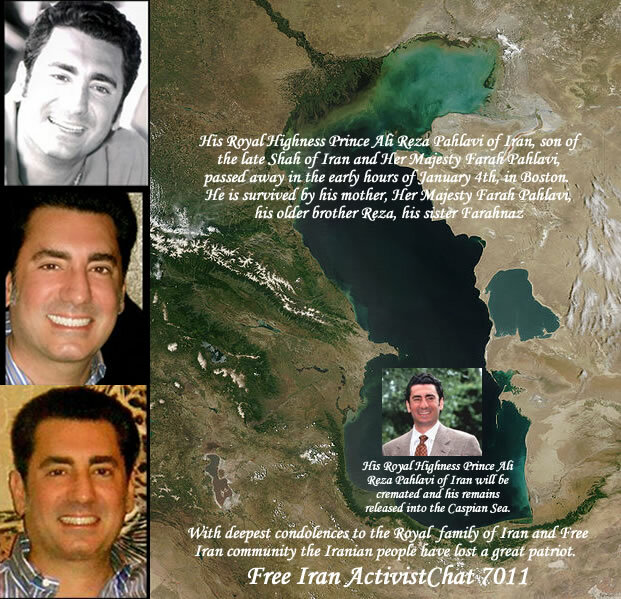 A la m�moire du Prince Alireza Pahlavi d�Iran tragiquement disparu le 4 janvier dernier, un rassemblement silencieux se tiendra Vendredi 7 janvier 2011 � 18h, Place du Trocad�ro (Paris XVI�me). To celebrate the life of Prince Alireza Pahlavi of Iran who tragically passed away on January 4th, a silent rally will take place on Friday 7th of January 2011 at 6 p.m at the Trocadero Square (Paris... 16th district). Why did Prince Ali Reza Pahlavi kill himself? Why did he do it? Why did a patriotic young man who was a hero and inspiration to Iranians and whose dream like all Iranians was to see a free secular Iran commit suicide? Is it possible that he was forced to take his own life in protest? Is it possible that he was so psychologically tormented by the human rights violations and atrocities he saw in Islamic Republic and the unjust and unfounded accusations and bullying against his father, the King, that he took his own life as other young Iranians in Iran who have been tortured, imprisoned, and blocked from education and work? Prince Ali Reza's suicide note clearly expresses these feelings. What factors could have contributed to his premature death? Is it possible that his life was prematurely snuffed out by the very forces that are wiping Iran's ancient history off the textbooks? Is Harvard University complicit in this death? Did Harvard grant him a PhD? If not, why not? Why was his PhD delayed for 20 years? Why was he discouraged from his PhD studies at Harvard? Is it because he was the son of a man who has been falsely vilified for 20 years by Mr. Khomeini and his supporters (liberal left, communists, radical muslims, and mossadegh supporters)? Why was he not allowed to become a professor of Iranian Studies while his fellow colleague at Columbia, Mr. Dabashi, the son of billionaire mullahs, is now full professor and director at Columbia University? Is it because Harvard, Columbia, and Stanford are monopolized by a group of Jewish/Islamic Pseudo Scholars who hand out PhDs and positions to their own? Mr. Dabashi has the gall to suggest that perhaps Prince Ali Reza Pahlavi committed suicide because "he knew he had no place in Iran." What a bunch of bull crap! This socialist-islamic Khomeini's supporter is a professor who jets around the world to give lectures while our beloved Prince was isolated, cornered, threatened, bullied, harassed, and barred. Every patriotic Iranian has a place in Iran today and in the future. Prince Ali Reza Pahlavi knew he would be a part of the future of Iran. Now he will be a part of our future in spirit. Is it possible we are witnessing the human costs of the blood drenched brutal, callous, operations and policy of British Empire and its blood sucking vampires, Mr. Khomeini and his successors to maintain British oil interests in middle east? The Crown Prince, Reza Pahlavi II has dutifully accepted the Boston Police's report and the suicide note that the young Prince left behind. Prince Ali Reza's death is a wake up call to the Iranian community overseas and in Iran to mobilize to save Iran and make it a habitable place for all Iranians. God Bless and protect the remaining Pahlavi Family and what is left of Iran. We need to unite as Iranians to restore our H.R.H. Reza Pahlavi as King of Iran. His father refused to abdicate. What does this mean? It means Crown Prince Pahlavi is the legitimate ruler of Iran. Long Live Pahlavi. Long Live a Secular, Democratic Constitutional Monarchy in our beloved Iran. سرکاربانو بهناز شهریاری. با درود. نامه سرکار درقبال نوشته من خطاب به یار مهربان جناب شهریار فتخی موجب نهایت تعجب گردید چون نویسنده آن پاسخ به آقای سجاد پور من بودم نه ایشان، وچون نشانی ایمیل من در آن پست وجود داشت لازم بود به من نامه می نوشتید! نخست اینکه مگر شما وکیل و سخنگوی آقای سجاد پوور هستید که لازم دانستید از نوشته ایشان دفاع کنید؟ مگر شخص آقای سجاد پور نمیتوانستند ایراد های شما را مستقیما بمن بنویسند؟ باری، همین نوشته هم به نشانی ایشان فرستاده میشود تا اگر فرمایشی دارند با شخص من در میان بگذارند تا نیازی به وکیل وصی نباشد. شما باید ار ابتدای نوشته آقای سجاد پور شروع میکردید! پرسش این است که بکار گرفتن سرلوحه نوشته ایشان " شازده کوچولو" آیا در ادبیات زبان پارسی توهین آمیز نیست؟ اگر بنابرهمان نوشته، ایشان یک پا در ینگه دنیا و یک پا در ایران دارند و با سردمداران حکومت آخوندان خوش وبش میکنند پس باید بدانند که انتخاب این سرلوحه از نظر ما ایرانیان توهین آمیز است!! تمنی دارم به این بحث ادامه ندهید چون صرف وقت گرانمایه به این نوع بگو مگوهای اینترنتی کاری بس عبث میباشد. I suggest you ask your friend to read Karim Sadjadpour's article one more time to better understand it. I love the Shah as much as I love my father. I am a monarchist and I know several other monarchists who correctly understood Mr Sadjadpour's article and appreciated it very much. In fact, Karim Sadjadpour is defending the Pahlavi monarchy against those writers who immediately describe it as "blood-soaked" or those who describe the Shah as "a two-bit dictator". He is not saying those things himself. He is saying that those who write such things do not have a good understanding of history, or of Iran . Too many of the writers and analysts who write about Iran in English are always attacking the Shah, and they know nothing about this great man's achievements. In fact, Stephen Kinzer, the well-known American journ ali st, wrote a disgusting article about the death of Prince Ali Reza Pahlavi (may he rest in peace), and Kinzer repeated all of the old lies and cliche's about the Shah. Karim was answering Mr. Kinzer and putting him in his place. I admire you for your loyalty to your country, the late Shah and his family. Believe me I am the same. It is important that we congratulate people like Mr Sadjadpour -- who is not a monarchist -- when they write things that are fair and true about the monarchy. We should not attack them. If we attack them, they will be discouraged and they will not defend the Pahlavi regime again. There is no doubt that Sadjadpour was defending the Pahlavi regime, not attacking it. Maybe the person who wrote the response should take a closer look at the article and maybe someone can translate it into Persian so those people whose English is weak would understand it better. Also, if you have read any of Mr Sadjadpour's previous articles or seen him on CNN or BBC, you will know that he is one of the harshest critics of the Islamic Republic and one of the biggest defenders of Iran 's freedom from these akhoonds. I hope you will encourage your friend to read the article again with these ideas in mind. آقای کریم سجاد پور، با درود. نوشته شما در مجله " فورین پالیسی " مملو از نادرستیها و غرض ورزیهائی است که به روشنی يا از کينه شخصی ويا از بی سوادی شما سرچشمه می گيرد. چرا؟ چون کسیکه برای بنگاه دروغپردازی و تحریف اخبار و دو بهمزنی، کار میکند و از بودجه بزرگترین و جنایتکار ترین استعمار گرجهان جیفه دریافت میگند هرگز نمیتواند خوش رقصی برای اربابش را کنار بگذارد! مضافا براینکه شما با تلویزیون الجزیره (شعبه عربی بی بی سی در ناحيه خلیج فارس) و شبکه خبری (ثی ان ان) که مزد بگیر آخوندان یعنی عوامل هفت خواهران خبیث نفتی هستند، همکاری میکنید! نقل از کوتاه بیوگرافی شما در زیر. نخست باید به آگاهی شمابرسانم با ایکه خود تحصیل کرده کالج آمریکائی هستم کوچکترین احترامی برای دانشگاها و مراکز تحقیقاتی وامثال آن از جمله همانجائیکه شما کار میکنید ،"بنیاد کارنگی" ندارم. لکن اگر آنان شمارا بعنوان ایران شناس و تحلیلگر پذيرفته باشند، خوش بحالتان ! چون برمصداق "درشهر کوران یک چشمی پادشاه است" شما راهم همانند آن يک چشمی بشمار می آورند!! شما نوشته اید"شاه ایران ثروتمندترین فرد جهان بود" آیا واقعا آنقدر سطح مطالعه شما پايين است که این مطلب به خودتان هم مشتبه شده و آنرا حقیقت می پنداريد؟ در حالیکه تاکنون خلاف نوشته شما روشن شده است! امروز میبينيم کسانی مثل بيل گيت، وارن بافت، و لاری اليسون سه ثروتمند بزرگ دنيا و آقای مايکل بلومبرگ نفر هفتم در رديف ثروتمندان دنيا قرار دارند و در ليستی که مجله و نشريه معروف فوربز منتشر می کند هرگز نام شاه ايران ديده نشده است. برای آگاهی شما که حتم دارم میدانید لکن خود را بکوچه "علی چپ" میزنید، ملکه دولت فخیمه یکی ازتروتمند ترین افراد جهان است. لکن شما بسبب دریافت جیفه ای ناچیز، این حقیقت ثابت شده را نمیخواهید ببینید! مهرورزیده به مجله " فوربز " مراجعه کنید. شما که بنابر نوشته خود، متولد ایران نیستید وشاید تابعیت ینگه دنیائی دارید، به تبع آنان که خود را یکه تاز میدان و آقای جهان میدانند بخود اجازه میدهید تا در امور سایر کشورها دخالت کرده و سخن پراکنی مغرضانه بفرمائید تا کمکی به استعمار نوین و خواسته های هفت خواهران خبیث نفتی کرده باشید. پس اگرشما بوق و کرنای استعمارگران نوین نیستید، چرا این مطالب مغرضانه را با آن سرلوحه خارج از ادب و نزاکت معمول ایرانیان، آنهم به هنگام سوگواری نه تنها خانواده پهلوی بلکه بقول خودتان عده زیادی از ایرانیان حتی جمهوریخواهان ،بچاپ میزنید؟ نکند مانند کبک سرتانرا زیر برف کرده اید غافل از اینکه ماتحتتان آشکار است!! شما سبب شورش آخوندی را فساد و سلطه گری پادشاهان دودمان پهلوی خوانده اید و کمترین اشاره ای به اعمال جناب جیمی کارتر و دوبهمزنی بنگاه بی بی سی که خود بدان اعتراف کرده اند، نمیکنید و پاسخ خود را از دهان " تاجزاده " میشنوید که بشما گفته است "در دوران پادشاهی ما همه نوع آزادی داشتیم بجز آزادی سیاسی" با اینکه این گفته آقای تاجزاده جای گفتگو دارد معهذا پاسخ دندان شکنی است به اتهامات شما! شما نوشته اید "میهن پرستی و مباهات به تمدن گذشته ایرانیان برای عده ای اندوهناک است" ولی نفرمودید آن عده جز جهان وطنی های چپ افراطی و یا مسلمانان امتی، چه کسانی هستند؟ آیا شما پروا دارید که اکثریت مطلق میهن پرستان را اعم از ایرانی و غیر ایرانی "اندوه ناک" بخوانید؟ اگر جرات و شهامت کافی دارید همین مطلب را در وسط میدان "ترافالکار" در لندن فریاد بزنید. تا ببینید اربابانتان چه بلائی برسرتان خواهند آورد! اشاره شما به گفته های محسن مخملباف بسیار جالب است، چون بقول معروف همانند آن روباه شهادت را به دمش حواله می دهد؟ ! آقای مخملباف در سایت "ویکوپدیا" که بدون تردید نوشته خودش میباشد اقرار میکند که درسن پانزده سالگی قصد ربودن اسلحه کمری پاسبانی را داشته که بعلت کشمکش با پاسبان مجروح و سپس زندانی گردیده و به ادعای موهوم شما �روشنفکران� در زندان "ستم شاهی" درس خوانده است و سپس در شورش آخوندان از زندان رهاشده و به سپاه پاسداران پیوسته و بعد از چند سال و ساختن چند فیلم با بازیگری جنایتکاری آمریکائی، یعنی قاتل روانشاد طباطبائی در واشینگتن آنهم فقط با دستمزد مبلغ ناچیز پنجهزاردلار، چون هوا را پس دیده زده است بدر!! حالا یک چنین عنصری شده است منبع قابل استناد جناب تحلیلگر بنیاد کارنگی!! براوو جانم دستخوش!!! جناب تحلیلگر تنها با آن قسمت از نوشته شما صد درصد موافقم که نوشته اید ایرانیان از هرچه اسلام و اسلامی است گریزان شده اند! این تنها دست آورد حکومت آخوندان است چه آنچه که رضاشاه و پسرش از عهده برنیامدند خود آخوندان کردند و میگنند و اکنون هم بدان اعتراف دارند که مردم از مساجد گریزانند و دسته دسته به ادیانی دیگر روی آورده اند!! آقای سجاد پور برای شما با آن ادعای �دانایی� متاسفم!!! یاران مهرورزیده این نوشته مرا هرچه بیشتر پخش فرمائید. باسپاس از پیش. You don't have to be an apologist for the Shah to mourn the early death of his youngest son. Iranians, it was once said, are afflicted by a unique strain of melancholy: Those who live in Iran dream of leaving, while those who were exiled dream of going back. When 44-year-old Alireza Pahlavi, the youngest son of the late Shah Mohammed Reza Pahlavi, took his life on Tuesday, it was undeniably attributable in part to a demor ali zing malady, chronic depression, which he may have inherited from his father. But it was also an undeniable aftershock of the 1979 Islamic Revolution, whose reverberations are still being felt today. A country like Iran that has repeatedly been subjected to public heartbreak over the last few decades -- most notably the loss of over 200,000 native sons in the ruinous eight-year war with Saddam Hussein's Iraq -- naturally confronts the self-inflicted death of a child of privilege with mixed feelings. As is often the case, however, Alireza Pahlavi's great privileges were coupled with equally profound misfortune. Until he was 12, he had experienced a fairy-tale childhood as a scion of one of the world's richest and most powerful monarchs. By 13, he had abruptly fled his homeland and experienced the painful and public humiliation of his family's legacy, as well as the death of his father from cancer. Later, he would lose the person closest to him when his younger sister Leila, age 31, killed herself in a London hotel room in 2001. For those, like myself, who were born outside Iran or left at a very young age, the term "exiles" was never an appropriate fit. We were second-generation immigrants, and we took it for granted that we would adopt new cultures and languages. We had few if any memories of or claims over what had been lost, only romanticized stories from elders about the verdant Caspian Sea region (shomal), the majestic Alborz Mountains, and the luscious Persian lamb whose fat was miraculously concentrated in the tail -- the original "junk in the trunk." Alireza Pahlavi's generation of uprooted Iranians -- young adolescents at the time of the revolution -- were often affected more profoundly than those who were too young to remember, or old enough to cope. Three decades later, many still struggle to find their bearings. They negotiate what Brazilians would refer to as saudade, a deep longing for something that is unattainable. Their lack of rootedness has often prevented them from forging stable emotional relationships and fulfilling their professional potential. I sometimes wondered why Alireza, a serious student who had cut short his Ph.D. studies at Harvard in ancient Iranian studies, remained silent all these years. Although the Pahlavi family's experience as exiles was no doubt softened by significant (though significantly exaggerated) wealth, it was made more difficult by the scorn of many of their exiled compatriots who held them partially if not entirely accountable for their collective plight. Consumed with his own demons, Alireza perhaps concluded that he had been dealt a hand that he could not win. If he remained on the sidelines he would be excoriated by some for not speaking out. And if he became active and outspoken, others would excoriate him for having Ahmed Chalabi-like aspirations, as they have his older brother Reza. So he chose to remain in his Boston home, surrounded by his books, with the shades always pulled down. As a student of history, Alireza was perhaps puzzled by the discipline's relationship to his father. While Hafez al-Assad, the ruthless Syrian dictator who massacred some 20,000 civilians in the city of Hama in 1982, is most commonly remembered as a "shrewd tactician," it has become impossible to maintain intellectual credibility while writing about the Pahlavi era without referring to the Shah as a "blood-soaked," "imperi ali st puppet."